For those guilds focusing purely on ten man content (of which my own guild is one), today brought some very welcome news from guildox. (For the benefit of anyone not familiar with this site, they’re the nice people who created a PvE ranking system for the strict ten man guilds). In order to keep their focus on the current content, they are removing the older achievements from the system, preventing them from affecting a guild’s PvE rank. This is particularly relevant to Yogg which, up until these changes, still weighed very heavily in regards to the rankings. Many people have commented that no one runs Naxx, EoE, OS or Ulduar any more so we plan to remove these achievements from the progress ranks in the next couple of days. This will reward guilds for running the current content and will not force them to run old content for the sake of improving their rankings. Personal update alert! 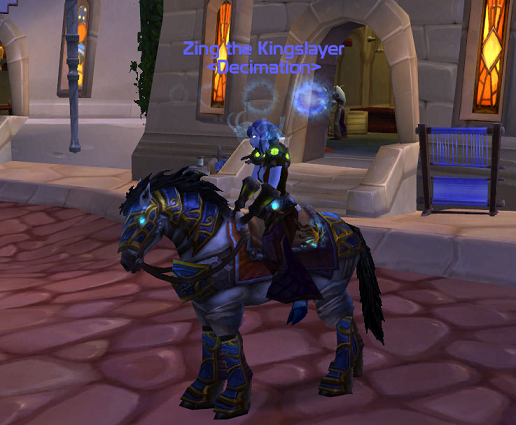 Tonight, my guild finally got down the Lich King and enabled the hard modes just in time for tomorrow’s reset. On a good note, this now means I can start work on a Lich King strategy, safe in the knowledge that it does indeed work. Back on topic, I’ll try and have a Lich King guide done this week, along with some of the missing boss guides. As we progress through hard modes, you can expect published guides to those too. Thinking of Switching to a Ten Man Strict Guild? Read On! As many who have read my blog will know, I’m an active, raiding member of a ten man strict guild. My role goes a little further than that, as I’m also in charge of handling recruitment for the guild. Since Wrath launched, all the raid content came in two varities; ten man and twenty five man. With this sudden change, a scattering of smaller guilds focused purely on the ten man raiding appeared. It’s easy to see why, for small groups of friends (be them in game or out of), gathering enough people for the ten man raids is easier and much less daunting than the larger raids. 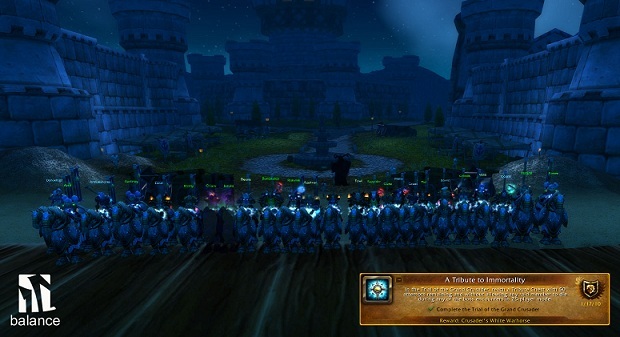 This facilitated many such groups forming their own guild rather than forcing them into applying to larger guilds (with no guarantee that they will all raid together) or having them forgo raiding altogether. For the more competitive player however, ten man raiding lacked a certain focus and the thrill of racing for those server first or EU first kills. They felt, in some respects, slightly meaningless. To the latter part of last year, one of the raid progress tracking sites, www.guildox.com, announced their intention to track the progress of these guilds that purely focussed on ten man content. This was exciting news for those guilds, as that sense of competition in their raiding would finally be provided as they had a way in which to track their progress against other guilds. To ensure that this progression ladder genuinely targeted the ten man guilds, guildox set clear guidelines for these guilds. Every time a member participates in a twenty five man kill, they gain a “flag”. To remain on the strict ten man ranking ladder, your guild has a limit on how many such flags they can gain. Flags move with the character who earned them also. This impacts recruitment in the sense that these guilds need to avoid recruiting players with existing twenty five man kills. Despite these restrictions, the interest in strict ten man guilds seems to be growing. When I first began recruitment for Decimation, there were very few ten man guilds around. Recently, more and more recruitment threads for such guilds are appearing and our own server of Eonar, has two dedicated ten man raiding guilds. I deal with a reasonable number of enquiries about our guild and such is the basis for this article. Ten Man Strict or Ten Man? A guild that do not care about remaining ranked are free to pug whatever content they like in their free time. Most people I speak with do not care about this for the most part. Some, however, are less keen when I mention specifically that they can’t pug Vault of Archavon – no more high ilevel tier pieces for little effort! Consider also that if you are a player keen on collecting achievements, you will be severely limited here also. Raid achievements account for a reasonable percentage of the total achievements available and a portion of these will be unavailable to you. Finally, think carefully about the fact there will be loot that is simply unavailable to you also. I’ve been surprised in the past by former members discontent at being unable to chase certain items of loot dropping in twenty five man instances. While we can all appreciate that a certain trinket is best in slot or that a specific item would be a huge DPS boost, if you’re joining a ten man strict guild then realise the loot available to you will be reduced. If you already have a number of twenty five man kills under your belt in Icecrown or Trial of the Grand Crusader, you may find your decision is made for you. Most of the ten man strict guilds will avoid these players due to the flags they carry with them. We recruited one player recently with a little twenty five man experience (in the form of two Icecrown Citadel kills). Luckily, the gamble has paid off on this occasion but I would be loathed to accept a player with a lot of flags as these are too “risky” for us. Should they be unhappy or fail trial, we are further limited as to who we can recruit (be aware, these flags stay with the guild, they don’t leave if the player in question moves on). Based on the above, if you have absolutely decided that you wish to focus on ten man raiding, I’d encourage you to stop participating in any pugs that will earn you such flags. I’m aware that it is tempting to be able to apply to a guild boasting full tier ten or a best in slot trinket but honestly, a ranked ten man guild will not care if that means you also carry flags. These guilds are already used to tackling content with gear applicable to the encounters and they take pride in not out gearing their raids. Regardless of the number of flags you carry, it is always worth approaching a guild as you may be lucky. However, be prepared for the fact that they might simply be unable to accommodate you without forfeiting their right to be ranked. If this is the scenario, then consider joining an unranked ten man guild. You may find your home here and be happy without seeing your guild name in a progression list (and after all, this is the basic difference.) If you later decide you wish to reapply to a ranked guild, you will hopefully have been focused on ten man raiding for long enough that you no longer carry the flags these guilds avoid so much. Should you be fortunate enough to be accepted into your choice of ranked guild then always check their specific rules in regards to twenty five man content. Needless to say you will make yourself unpopular fast should you gain the guild a flag by not thoroughly understanding the restrictions placed upon the guild. These ladders will give you the names, servers and where applicable, the website URL’s of your target guilds. A final note here, not all of these guilds will have websites. For a reasonable amount of time, we didn’t. With so few people to organise you may find most discussions take place in game. In these instances, don’t be afraid to log on the server and ask members of the guild for the names of an officer. Most people will be able to tell you whether or not they are recruiting also. Once you have narrowed down your search and have the URL’s of the guild’s you are interested in, start scanning for those whose raid times match your availability and who are looking for new players. Many of these guilds carry very small rosters so your availability for most of the raids is a huge advantage to them. Some of these guilds will have application forms and regardless, I’m not going to write an article on how to apply to a raiding guild. I will, however, provide some hints at the kind of information I look for from our own applicants. Be very specific on the twenty five man kills that you have and any achievements you have earned. It makes it easier for a guild to consider whether they can accommodate you. If you come from a twenty five man raiding background, explain why you want to focus on ten man raiding. We have trialled people in the past who seemed to hate the restrictions placed upon them and the fact they forfeit the chance at certain loot. Ten man raiding is a choice but be sure to elaborate on why you wish to take that choice. If you have any useful alts (by useful I mean level 80, reasonably geared and again, without endless twenty five man kills), detail these. As previously mentioned, some of these guilds run with very small rosters and we have, on occasion, used alts to field specific setups. Why this guild? Ten man guilds by nature are more sociable and the atmosphere is quite different. Due to their smaller size, most people will know each other very well. You may find the core based on real life friends or people who have known each other in game for a few years. Explaining what you are looking for in a guild will help the officers to decide whether or not you will be a good fit with their members. Smaller guilds result in the members knowing each other better. This can be a huge boon for those the more shy players who find joining a new twenty five man guild a daunting experience. Less players means easier management. You will probably find these guilds more forgiving on real life schedules such as members being slightly late to a raid on a given night. This can be a plus or a con depending on the individual. My last twenty five man guild were raiding six nights a week. If you wanted to participate in ten man raids, they had to be organised outside of this. The result was for a few days a week, we were running our ten man group during the afternoons. This made for a pretty intense schedule. There are some raids you just can’t do without forfeiting your guild’s right to be ranked. As such, there are some items you just won’t see. These may even be quite common drops and very accessible for a twenty five man raider. Larger guilds normally have an excess number of players to cover all spots if people are not available. Ten man guilds often run with much smaller rosters and one person missing can mean a cancelled raid. This can make you feel more pressured to show up or rearrange real life commitments around your guild. I mentioned this above also but depending on your real life schedule, this could be a down side. You have less available raid content so most of these guilds will raid fewer days. If you’re a player that thrives on a busy raiding schedule, this might not be for you. This can be quite painful for the players who enjoy striving to collect as many achievement points as they can. Twenty five man raiding accounts for a lot of potential achievement points. This is semi related to the point above but considering what a bone of contention this has been amongst the ten man raiders, I think it earns it’s own point. 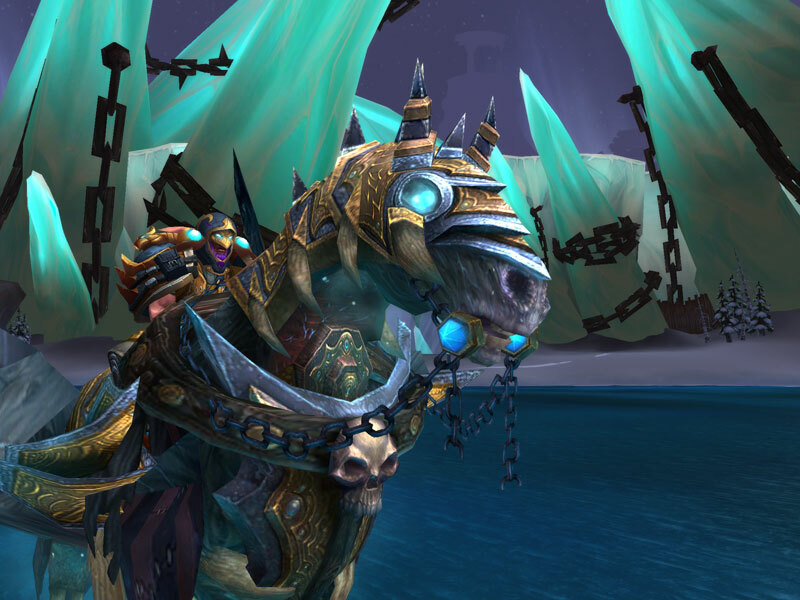 The coveted Invincible, Arthas’ undead steed is not available to us. 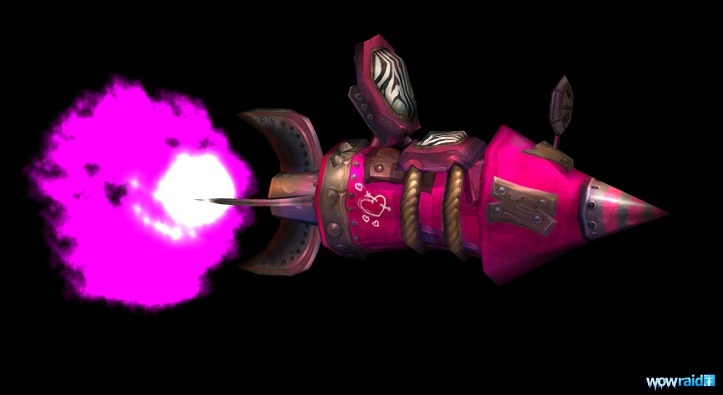 Mimiron’s Head, the amazing flying tinkered contraption is not available to us. In closing, ten man raiding will suit some people and not others however it is nice to have a choice now. Hopefully, Blizzard will continue to support ten man raiding as a viable alternative to twenty five man. As I mentioned before in my hugely long comparison between ten and twenty five man raiding in WoW, the rewards for the ten man raiders don’t always feel quite balanced in comparison with the larger guilds. This issue has been aggravated this week with the announcement that Invincible, the mount reward for killing Prince Arthas on heroic difficulty will only be available as part of the twenty five man encounter. Back on topic. 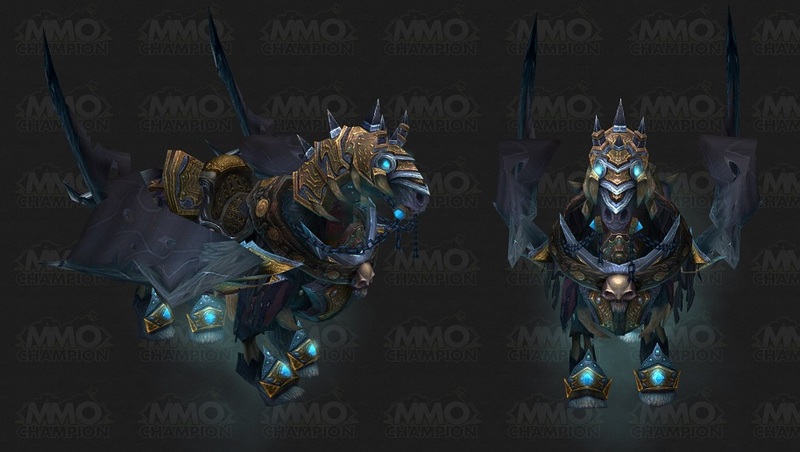 It became apparent during the PTR for Icecrown Citadel that the winged horse model belonged to Invincible, mount and lifetime equine companion of Prince Arthas. 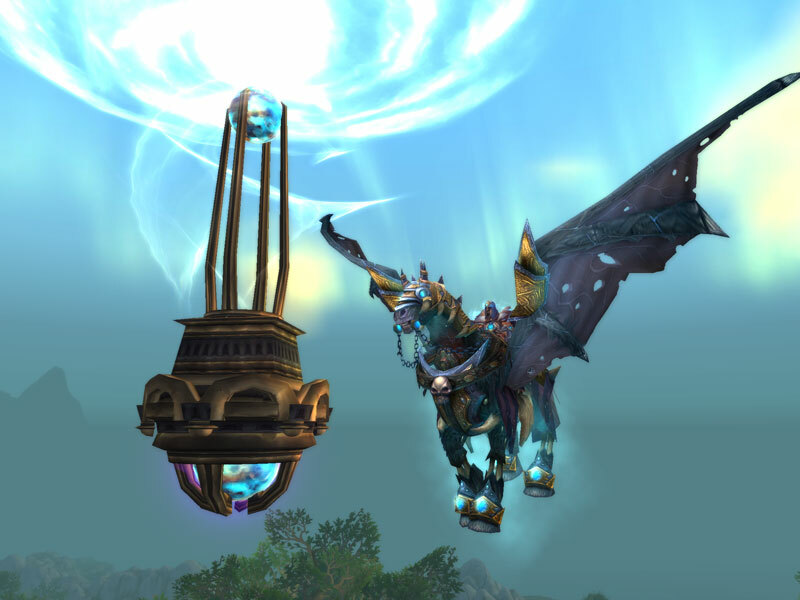 Since then there has been a lot of speculation and calls for clarification about the mount. This week, we received exactly that confirmation when a blue announced that similar to the Yogg Saron hardmode achievement Alone in the Darkness (i.e. defeat Yogg without the assistance of any keepers) where Mimiron’s Head would be a guarenteed drop reward, Invincible would work the same way. Can I understand it ? Well yes, with raids working as they currently do. Invincible is the mount of Prince Arthas – the end raid boss of the Wrath of the Lich King expansion. There should be an exclusivity about this mount. It certainly wouldn’t feel in keeping with the lore to see a line of “Invincibles” parading around Dalaran. On the other hand, for those strict ten man guilds who do manage to down Arthas on heroic difficulty, do they not deserve a reward for their efforts? These people will not be using twenty five man epics to out gear the encounter. They’ll have progressed there purely from ten man content and just like for twenty five man guilds, this is the last battle of the expansion. This is what all their hard work will have been leading to. I’m sure the ten man version will get some token drop, much like the bizarre tentacle trinket they were offered for defeating Yogg with no keepers left in Ulduar. I don’t think these rewards are any real consolation when you consider the amazing mounts the larger guilds get. The model is still amazing and I wish all the guilds out there the best of luck obtaining one. Without a doubt, Wrath of the Lich King has been an interesting expansion for World of Warcraft. Before it’s release, the appearance of Blizzard’s new buzz phrase became apparent “bring the player, not the class”. They decided to homogenize many classes, distributing previously unique raid buffs among others. This was met with a mixed response from the players. It made raid configurations much easier to deal with but many disliked that their class suddenly felt less unique. In addition to these changes came the vision of bringing raid content to more players. Blizzard wanted everyone to see the end game in some capacity. From their point of view, it made sense. Their are claims that a mere 1% of the player base saw Sunwell Plateaux in it’s original, pre-nerfed state. M’uru became known as the “guild killer” after many respectable guilds struggled to keep up the motivation while learning this unforgiving encounter. Blizzard stated there would not be another Sunwell and that they simply could not justify pooling such a large amount of resources into an instance that so few people enjoyed. So, we come to the release of Wrath. From a raiding context, it was not a great release. Naxxramas was pitifully easy. Malygos was not much better. The Obsidian Sanctum, however, introduced a new concept to WoW raiding; hard modes. For the first time we had one instance, but different difficulties encased within and it seemed to work. Defeating Sartharian with his three guardian drakes alive kept many guilds occupied for some time. This new expansion brought about another change to our raiding content. While we had experienced ten man raiding before; we had Karazhan and Zul’Aman during The Burning Crusade, we hadn’t been offered it on quite such a scale. Suddenly Blizzard were conveying that all their raid content would have two different modes and thus was born the twenty five man instances and their ten man counter parts. There were multiple ways to view this change. Firstly, it allowed guilds to practice the strategies of a fight on a smaller scale before taking it to their main twenty five man raids. Secondly, it gave additional ways for people to gear up. Thirdly, it gave some of the faster clearing guilds more raid opportunities and many began doing ten man raids on off nights or after their main raids ended. Lastly and perhaps the least recognised, it gave smaller guilds the possibility of their own distinct progression path. Suddenly, rather than needing twenty five people to raid, you needed ten; a huge difference for a small group of friends. Furthermore, the “fluff” rewards from completing achievement sets were given to ten man raids too. Those smaller guilds could earn their own drakes. Let us fast forward to September 2009. It was at this time that a progress tracking site announced what a small pocket of the raiding community had been waiting and hoping for. Guildox announced their intention to start tracking the progress of “ten man strict guilds”. To clarify, for the guilds that genuinely were ten man guilds, their efforts were to be recognised more officially with a ranking system to mirror that of the larger, more traditional guilds. At this point I wish to stress on behalf of the ten man strict guilds out there, how greatful we all are to guildox for this change. Finally we could have the thrill of racing for the EU first kills as well. Finally, we could get a taste of competition. Guildox ranking system has brought with it problems however. To qualify for this ladder, you have to forgo twenty five man raiding completely. This in itself, is quite obvious. Ten man content can be (and often is) steam rolled by people in twenty five man gear. This restriction has more wide spread implications however. Firstly, where many guilds will have “social” members (people who maybe once raided and can no longer do so or the friends or family of full time raiders perhaps), ten man guilds are limited in this option. We can not afford to have people participate in twenty five man raids. If a member kills a boss in a twenty five man raid considered “current content” (for reference, at the time of writing this covers Icecrown, Trial of the Grand Crusader and will soon extend to the new Vault of Archevon boss), we get a flag. Collect too many of these and you are removed from the strict ten man ladder. Incidentally, removing the offending player from your roster will not remove the flag. It doesn’t end there however. We also have to be mindful of new recruits. Their kills travel with them. As an example, if we were to recruit a new member who has previously raided twenty five mans, his kills count against our record. This limits our potential recruitment base enormously. We primarily need either people who are coming from a ten man environment already or people who have not been at the forefront of PvE raiding for a while. 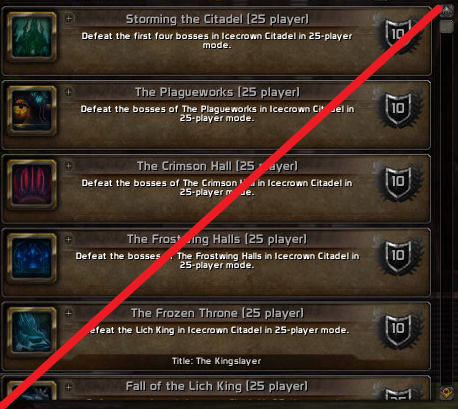 Finally, for those of us who enjoy the achievement system in WoW, we can’t even join pugs to gain a few extra points. We’re totally limited on the achievements available to us if we wish to remain part of a ranked guild. In addition to our shiny new rankings, Blizzard also began to notice strict ten man raiders in a fashion. New achievements appeared with Ulduar with the prerequisite that the players of a raid had to use gear of an appropriate level. “Herald of the Titans” was the first, albeit twenty five man guilds still had an advantage in being able to use the higher level gear sets from Ulduar. 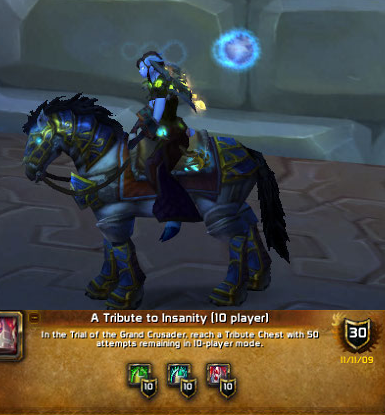 Trial of the Grand Crusader, on the other hand, brought with it “A Tribute to Dedicated Insanity”, the final hurdle in the ToGC achievements; clearing the instance with no deaths and in only ten man gear. I was recently contacted by an officer in another ten man strict guild alerting me to a thread started on the official forums asking Blizzard for more recognition of ten man raiding as a viable progression route in WoW. There were many suggestions on how to encourage this but here I’ll focus on mine. Firstly, lets look at the achievement system. Loathed by some, revered by others, it was another new addition in Wrath. Some people go to great lengths to try and receive as many achievement points as is possible. Most of the achievements are exactly duplicated between ten and twenty five man encounters so why not allow players to merely earn one set? By allowing twenty five man guilds to steam roll the ten man content, the value of most ten man raiding achievements is lowered. If you out gear your content, of course obtaining achievements will be easier and there is no way to distinguish whether someone used relevant level gear or merely waited for the encounter to become trivial. Naturally, achievements like dedicated insanity go some way to combating this. However, with our current ranking system, ten man players forgo the opportunity to gain many achievement points. Changing the achievement system would not prevent larger guilds from still doing the ten man content. They can still farm it for additional emblems. They can still utilise it to gear up new members and rerollers alike. They can still clear it on off nights as something to do but they would no longer diminish the value of the achievements earned by the genuine ten man guilds; the ones who combat this content with the correct level of gear. Secondly, the loot tables need some addressing. As it stands now for my shaman, the best trinkets available to her are Muradin’s Spyglass (and Icecrown drop) and Eye of the Brood Mother. The latter is from ten man Ulduar. Admittedly, it was an amazing trinket and one sought by many raiders but it’s also from an instance released close to one year ago. Trial of the Crusader and Trial of the Grand Crusader brought with it some amazing trinkets on it’s twenty five man version. The Reign of the Unliving and Reign of the Dead are both incredible and they remain best in slot for casters at present. By comparison, in the ten man version of the instance, casters got the Talisman of Volatile Power a diabolical trinket that frankly, no one wants. The “fluff” rewards are also questionable. The “Alone in the Darkness” achievement is still considered difficult and relatively few ten man strict guilds have completed this. For the few that complete this, they can look forward to the Vanquished Clutches of Yogg Saron; a trinket calls forth a Yogg style tentacle. For the twenty five man guilds? Mimiron’s Head; a very rare and very unique looking mount. I know which I would choose. The trend continues in Trial of the Grand Crusader where a Tribute to Insanity on ten man will net you a Swift Alliance Steed. On twenty five man however, you earn a feat of strength and the entire raid receive Black Warhorse. We achieved our first insanity run back in November so, obviously, we’re still collecting mounts for our raiders…. After all of this, you may ponder why then I chose ten man raiding. Most twenty five man guilds are plagued with a singular problem in regards to the skill level of their roster. You don’t have to be a genius to know that recruiting is hard. It doesn’t matter if you’re Ensidia or a guild that will never realistically see hard modes until you out gear them dramatically; recruiting is hard. Many guilds form with that one holy grail of goals. “We want world firsts!” Some, of course, are just plain unrealistic and formed by people who lack the experience, skill and dedication for that. A percentage aren’t though. They have genuinely skilled and committed players at their core. Most guilds, however, have a group of players that are just down right poor. Remember the days of Black Temple and Teron Gorefiend? How many of you remember begging to an invisible WoW God that “that” person doesn’t get constructs first? Later on in the fight, it wasn’t quite so bad if a poor player got them, providing the one before was competent. However if “that” player was first with the debuff, you knew it would be a wipe. Mount Hyjal saw players needing to click an item in their inventories to save them from the falling damage when Archimonde blasted them skywards. Fast forward to Sunwell and we had Felmyst with beams that required the player they focussed on to “kite” them away. The twins had the conflag ability that needed the targeted player to hop out of the raid and run a short distance so as not to blow everyone up. This brings me to ten man raiding. There is a huge difference between the roster required to support a ten man guild than a twenty five man and it’s not just a numbers game. Ten people are easier to coordinate. It’s easier to accommodate the individual, real life commitments of ten people than of twenty five. What does this mean? In my opinion you can maintain higher standards. A second aspect to consider is the social atmosphere of a guild. Most raiders will spend a vast amount of time with their fellow guild mates. For those at the cutting edge of content, they probably spend more time with them than their more tangible friends and family. Most people in a twenty five man guild can not claim, hand on heart, that they are friends with everyone in the guild. In all honesty, they might not even know everyone in their guild. A small twenty five man raiding guild probably holds around thirty two active members to ensure full raids every day. This number then scales upwards to some having hundreds, particularly when you included the social members. (Incidentally, “social” rank frequently makes me giggle when many of these members are people who stopped raiding years ago but still feel they have a claim to guild membership. The active members carry a guild forward and often these “social” members are anything but social! They are normally remembered by one or two very old members while everyone else wonders who on earth they are and why they are still guilded. Rant over and normal transmission resuming). In a ten man guild, you will know everyone you raid with. Most of these guilds seem to have around twelve to fifteen active raiders. You may end up knowing them more than you ever wanted 😉 It is easy to feel like you’re drowning in some larger guilds. You’re one of many representatives of your class. Some guilds have to rotate players a lot. A feeling of “not making a difference” can develop where you get a sense that if you left, it wouldn’t be a huge deal. Not so in ten man raiding. With these smaller guilds you genuinely are a person and not just a class. A third aspect which doesn’t apply to myself but is worth mentioning is the technical requirements of raiding. For some people, twenty five man raiding is unrealistic (or maybe even impossible) on their PCs. A large portion of the WoW player base are younger people and a lot are students. For the people who suffer FPS too low to perform in twenty five man raids, you have a significantly higher chance of being able to do so in ten mans. Finally comes the loot. Obviously, ten man loot is a scaled down version of it’s twenty five man counterparts. This is relative though, our encounters are scaled down versions of their counterparts too. Due to itemisation not always being great, some ten man heroic items have been best in slot in the past. We earn emblems slower than the larger guilds certainly, but we share our loot with nine other people in the raid. Depending on our rosters, you are likely to be the only class-spec combination in your entire guild. Naturally in the case of many items, multiple classes will want them but never the less, we have to wait less time. In addition, we can build offspec sets much faster (we often get the variety of playing those offspecs more also). There we have it. What began as a random thought for the evening turned into a rather epic post encompassing the pros and cons of ten man raiding. While there is no doubt that it wouldn’t suit everyone, for some people it is perfect. I also hope this makes others realise that we’re not the “scrub raiders” of the PvE scene. We’re not all guilds that fail at building twenty five man rosters. Some of us are genuinely passionate about this raiding route. While the encounters and achievements may seem easier to many eyes, done with the appropriate level of gear, they are not. At present, there is a healthy amount of ten man strict raiding guilds appearing and racing for the EU first kills in Icecrown. I wish the best to all our competition and sincerely hope that Cataclysm brings more recognition to ten man raiding as a viable PvE progression path. Finally, to Blizzard, you wanted to open up raiding content to more people. Ten man raids are the perfect way to facilitate this, if only you would give them a little more support and recognition as opposed to letting the larger guilds stomp all over our accomplishments with their higher level gear.